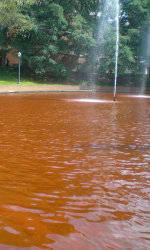 Central Spirit has dyed the water in the reflection pond in front of the R.M. Cooper Library on Clemson’s campus orange as part of its Spirit Blitz for the Clemson vs. Auburn football game on Saturday, September 17. Click on the link below to view a live webcam of the library reflection pond on the University’s website.